Last week my son's kindergarten class concluded the school year with an International Festival to showcase all they'd learned in geography. Doting parents, grandparents, aunts, and uncles all enjoyed the charming show. C worked so hard on his lines and grinned from ear to ear at showtime. All the parents were asked to bring an International dish for a feast after the program. This is very scary when you have kids with food allergies. And while I didn't think there would be any shellfish hiding out in the food, I wasn't so sure about those sneaky nuts, and E was going to be eating there with her brother. In the past, when we've been invited to potlucks, I typically bring one main dish and one dessert. That way, E will have a nearly complete meal that is entirely safe, and I can then supplement her meal with whatever else is certain to be safe (fresh fruit and veggies, chips, etc.) Last week, however, I was so short on time that I was only able to make one dish to take to this International Feast. I decided on dessert. Nuts tend to hide very easily in desserts, ground into flour or baked into cookies, and this scares me most of all. Of course, I had to represent my first love, Italia, so I knew I was going to bring Biscotti. 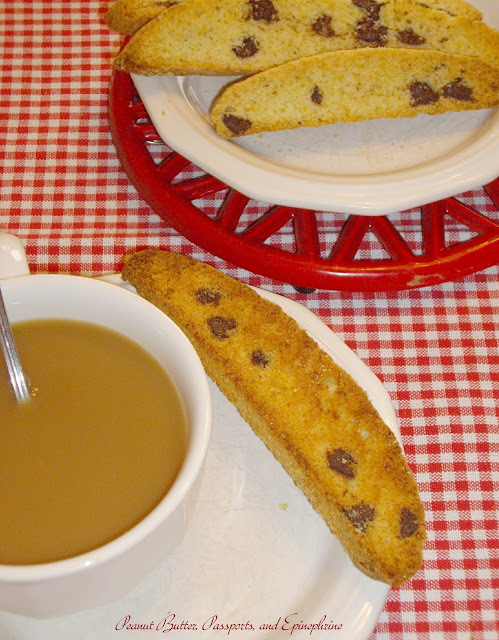 I used to bake biscotti all the time, pre-kids. Loaded with hazelnuts and almonds, coated in Nutella - oh how I miss them. I haven't made them in a long time, however, because they just aren't the same without the nuts. I came across this nut-free recipe in Giada de Laurentiis' book, Giada's Family Dinners, and decided to give it a try. Oh yum! The anise gave the cookies an almost almond flavour, without any nuts, which completely satisfied my craving for nutty biscotti. I made just a few changes to the original recipe. I cut the amount of chocolate chips in half, because, honestly, I want to taste the cookie behind the chocolate. I ground the anise seeds by hand, being careful to leave some whole while others were completely pulverized. I formed the dough into two smaller loaves instead of one giant one, and the cookies were so much more manageable (and the perfect size for little hands). They were a huge hit, and the kids devoured them enthusiastically. I hope you enjoy them just as much! Preheat your oven to 350 F (180 C). Line one large baking sheet (or two smaller ones) with parchment paper. Grind the anise seed in a mortar and pestle until it is your desired consistency. I kept some seeds whole while grinding the rest very finely. Whisk the flour, baking powder, salt, and chocolate chips together and set aside. Beat the sugar, butter, and ground anise seed in a large bowl. Beat in the eggs and then the flour mixture. Beat until just combined. Divide the dough in half. Lightly flour your hands and form two logs that are about 8 inches long by 2 inches wide on the baking sheet(s). Bake for 20 - 25 minutes until the logs are light golden brown. Cool on the pan for at least 30 minutes, then transfer the logs to a cutting board. Cut the logs on the diagonal into slices that are about 1/2 inch thick. Place the slices back on the parchment lined baking sheet (you may need to use two baking sheets, or do this in batches). Bake until the slices just start to turn golden, about 15 minutes longer. Cool completely and store in an airtight container. These sound like the perfect treat for children and adults alike! I love the flavour of anise. 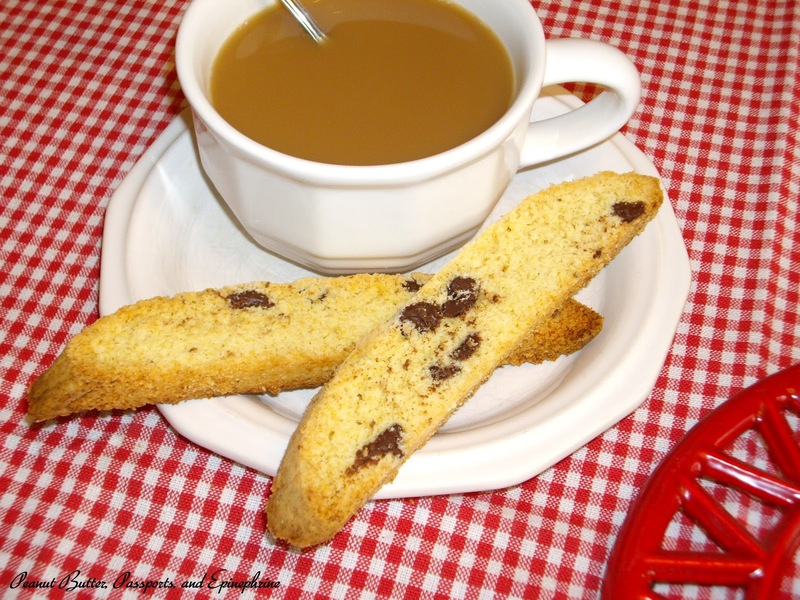 Your biscotti look so good! Being Italian American I love the taste of anise and with chocolate sounds terrific. Thanks for sharing this on foodie friday.